A: What exactly are legumes and are they the same as pulses? The terms ‘legumes’, ‘pulses’ and ‘beans’ can certainly all be very confusing. A helpful way to keep these straight is to remember that ‘legumes’ is the overall umbrella name, just like ‘fruits’ is the umbrella name for a huge category of different types and varieties of fruits. Legumes simply refer to all plants whose fruit is enclosed in a pod. However, pulses only refer to the dried seed itself. 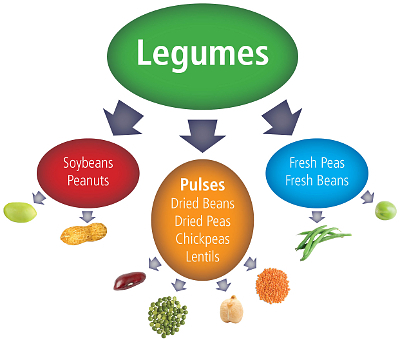 So under legumes are 3 main subcategories: soybeans and peanuts, pulses and fresh beans/peas. See the graphic above from Pulse Canada which illustrates these categories aptly (see source citation for more details). Pulses include dried beans, dried peas, lentils and chickpeas. Pulses are cheap, nutrient dense, low in fat, available throughout the year, and are high in protein and fiber. Soybeans and peanuts are separated out into their own separate subcategory due to their higher fat content. Legumes are also super versatile, as they can be cooked to the age appropriate texture in a variety of forms (e.g., pureed, mashed, or whole/halved but in soft cooked forms) for infants, toddlers and children of varying ages depending on their stage of oral motor development.